Episode 50 is here! Halfway to 100 so it's a milestone right?! 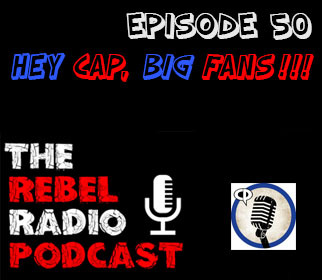 We think so as Mark, Matt, and Frank are here to bring you the latest and greatest from the Rebel Radio studio. Comicpalooza 2016 is just a month away so we talk about some of the celebrities we are looking forward to gazing our eyes upon and promise not to stalk Kate Beckinsdale! If there was one celebrity you would like to meet who would it be? We talk about this and geek out on a few of our favorites. We then discuss May the 4th and what we thought about the annual fan created holiday that is Star Wars Day and the casting of the young Han Solo for the upcoming spin-off film! We then get into the good stuff as we talk about the epic Captain America: Civil War that is now in theaters. We get heavy into spoilers so we hope you have had a chance to see the film and enjoy our review. We break it down for you and give our thoughts on the film itself, the new guys a.k.a Spider-Man & Black Panther, and also talk about our negatives on the film, though there was very few! And what about Aunt May being so hot?!! Hell yes!! There is also some talk about the new Assassin's Creed trailer, the current going on's of The Flash, Arrow, and Legends of Tomorrow as they wind down there seasons, and we even discuss some Arnold Schwarzenegger somehow in this episode!